Radish is healthy, and a fast growing crop. It is a member of the mustard family. A healthy radish is hard and firm, has bright reddish white color with green leaves at one end. It is a winter crop and is a very nutritive root plant. But it is worth it for the many radish nutrition benefits. Radish and their greens contain excellent amounts of vitamin C. The leaves contain a large amount of Vitamin C and calcium. It also contains trace mineral Molybdenum, as well as potassium and folic acid. It has medicinal value for curing liver disorders. The sulfur based chemicals increase the flow of bile. Radishes should be included in daily meals as it aids digestion. It should be eaten in raw form, since the cooked form contains less vitamin C than the raw form. Most of the part of radish (about 90%) contains water. It contains potassium and ascorbic acid, which is found in bananas and oranges respectively. Stimulation of appetite: Radish stimulates the appetite, activating the digestive system to process more food. 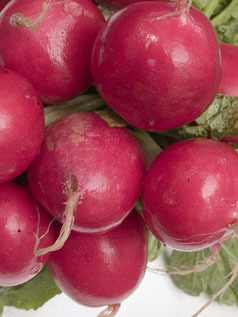 Vitamin content: Radish contains large amounts of Vitamin A, B, and C, which benefits the body in various ways. Liver and gall bladder: Radish maintains the working of the gall bladder and liver. The secretion of fluids inside the body works more efficiently when including radish in your diet. Cures digestive problems and jaundice: Radish is the best remedy for removal of any problems related to digestion, and it also works best for curing jaundice. Removes mucus and soothe headaches: Radish in daily diet helps for the elimination of mucus and it also helps to reduce headaches and migraine problems. Radishes can be purchased trimmed or with the attached green leaves. You need to choose compact and solid radishes as the softer ones have a pithy interior. The leaves of the vegetable (which are also used by many people) should be green and healthy. Leaves can only be used within 1-2 days of purchase and if you want to store the vegetable for longer periods, you need to discard the leaves and store the vegetable itself in the refrigerator. Radish nutrition benefits are plenty. Radish is a useful vegetable and benefits the body in many ways. There are no real known health concerns generally noted with radish consumptoin although as with most foods common sense should prevail. Eating a well rounded diet is always the best rule of thumb.